The contrast between internal and external renders the double condition of tea as a dried leaf and as an infusion. The system of pleats allows the base to unclench itself at the opening of the box. 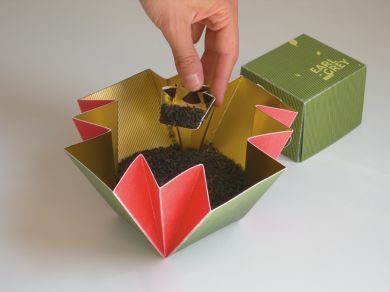 A dosing device is obtained by cutting a part of the package itself and folding it. Bucchetti, Valeria, Packaging tra vista e tatto, Edizioni POLI.design, Milano 2007.